I have been hearing about the burger at Quinn’s Pub on Capital Hill for some time now. Last night I finally got up enough motivation and spite to pay them a visit. Known as a gastro pub, a pub which is gastronomically sound AKA serves delicious quality food yet remains true to it’s pub roots. Frankly, the idea seems illogical in some sense. I mean, who goes to a pub looking for high-brow pretentious food and the wankers that often times frequent such places? Well, honestly, when pulled off correctly a gastro pub makes all the sense in the world. Great beer and great food. Without the idiots. The Quinn’s Pub burger is, in a word, exceptional. A 1/2 pound patty of gorgeous, and I mean gorgeous beef from the people at Painted Hills. A lovely melted slice of cheese, white cheddar I believe, and a generous slag of quality bacon. Add to the equation a ridiculously serious bun and some nice fresh mayo and the burger is complete. No lettuce, no tomato, no pickle, no onion, no nothing else. Sans rabbit food, This burger is a statement. What might strike most as a glaring burger oversight, the risk involved with a vegetable-free burger is tremendous, is simply executed with perfection at Quinn’s. The beef is so absurdly good that it serves as both the main event and supporting cast that provides that accompanying freshness that most burgers rely on earthy toppings for. Quinn’s burger is legit and lives up to everything one can hope for in a hamburger, providing us all with hope and a reason to live. 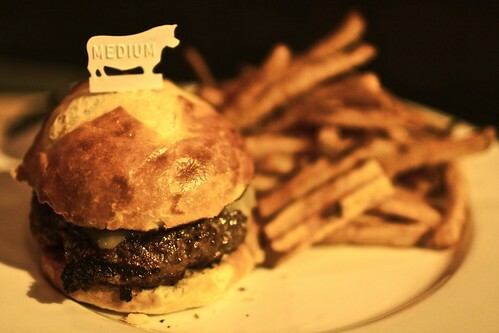 + We give hooves up for Exceptional beef, cooked to order, and one of the best burger buns one is ever likely to consume. – We give possible hooves down for lacking any vegetables, though this is an extreme stretch as I’m still searching for a negative with this burger. It’s that good. Looks like the new holder of the crown for sure. Nice find Drew! The bun looks, sweet? Was it? If by sweet you mean kind of sugary and the opposite of savory, then no. And I definitely would have jacked it’s score if it were. But if by sweet you mean completely rad and full of win, then yes, it was very sweet indeed. Drool. I must go here. They have a pretzel with Welsh rarebit. OMG.